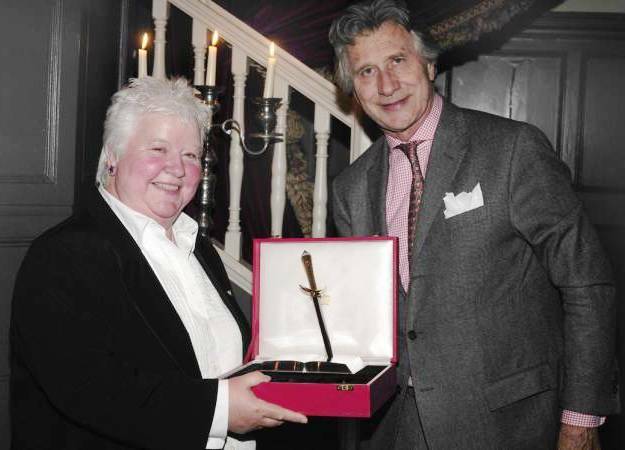 Last Tuesday evening, 2010 Cartier Diamond Dagger recipient and legendary crime writer Val McDermid wrapped up her four-city tour of New Zealand with a packed event at the award-winning Women's Bookshop in Ponsonby, Auckland. I understand that all four of McDermid's events drew very good crowds, in Dunedin, Christchurch, Wellington, and Auckland. 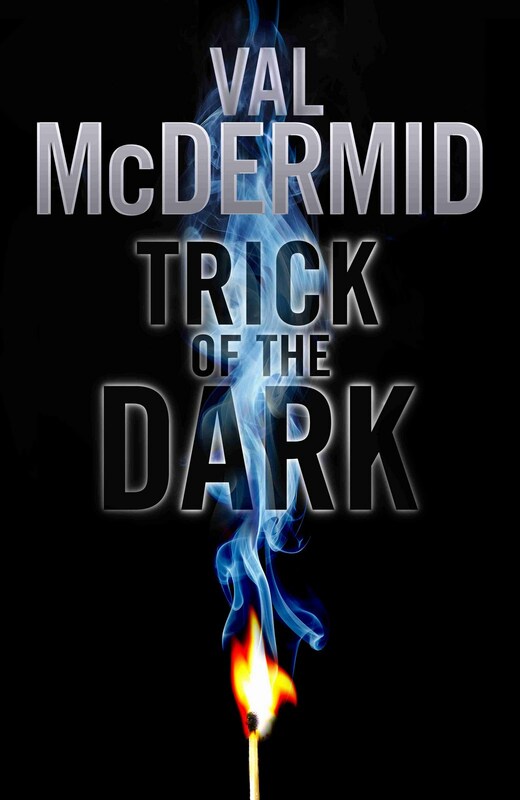 McDermid was in New Zealand in support of her latest crime novel, TRICK OF THE DARK, a standalone thriller which as she jokingly put it has "a dyke on every page", containing more lesbian characters than even her Lindsay Gordon books from the early part of her career. The blurb for TRICK OF THE DARK says, "'Death is a hollow drum whose beat has measured out my adult life.' So writes Jay Macallan Stewart in her latest volume of memoirs. But nobody has ever asked whether that has been by accident or design. Nobody, that is, until Jay turns her sights on newly-wed and freshly-widowed Magda Newsam. For Magda's mother Corinna is an Oxford don who knows enough of Jay's history to be very afraid indeed. Determined to protect her daughter, Corinna turns to clinical psychologist Charlie Flint. But it's not the best time for Charlie. Her career is in ruins. Pilloried by the press, under investigation by her peers, she's barred from the profiling work she loves. What Corinna's asking may be her last chance at redemption. But as Charlie digs into the past and its trail of bodies she starts to realise the price of truth may be more than she wants to pay." I was fortunate enough to read an advance version of TRICK OF THE DARK a few weeks ago, and in my opinion it is a very good read. I enjoyed it a lot. It was a great atmosphere on the night at the Women's Bookshop, as McDermid mixed and mingled with the gathering crowd for quite a while, before sharing some of her thoughts on her upbringing, her writing career, books, and life in general, and then reading an extended passage from TRICK OF THE DARK (see photo of Val reading above). Afterwards she answered a few questions, and then signed books for the crowds and chatted some more until everyone had left. All in all McDermid was in the store for more than two hours, before finally being whisked away to dinner by her hardworking publicist Karen McMillan. As some of you may know, despite the dark and at-times gruesome nature of some of McDermid's crime writing, in person she is a jovial and opinionated person who is a heck of a lot of fun to be around. Val shared how one of the only books her family had when she was growing up in working-class Fife was Agatha Christie's THE MURDER AT THE VICARAGE. She read it, enjoyed it, and was delighted to see from the inside flap that this Agatha lady had written lots of other books too. The problem was that although she was a regular at the library (she joked the best thing her parents ever did for her was moving close to the public library), the Agatha Christie books were all in the adult reading section, which you couldn't get into without an adult membership card. So, how did the intrepid young future crime-writer solve this problem? She 'borrowed' her mother's card, and told the librarian that her mother was bedridden and needed her to pick up adult books for her. This went on for quite a while. Then when Val was recently back in Fife, she realised that one of the librarians from back in the day was still on staff ("As a kid, I'd thought she was ancient back then, but she must have been all of about 20"), and when Val was in the library with her mother, the librarian said 'Oh, Mrs McDermid, it's great to see you up and about. I wasn't sure if you were still with us, with all the troubles you'd had'. Even though she's fairly well-established into adulthood herself now, that didn't prevent Val getting one of 'those looks' from her mother! Val also talked about how it was at Oxford where she realised that she was a lesbian, and then "everything kind of made sense". She was also still a keen reader, and found Kate Millett's book SEXUAL POLITICS so liberating and interesting that she burst into a tutorial once and just rabbitted on at her rather stiff-upper-lipped tutor about how great this book was, and how it was full of life etc. After Val had tired herself out, she wondered if she'd been a little over-enthusiastic for the staid academic, before this very prim and proper lady quietly said "Ah yes, dear Kate, I was actually her advisor for that thesis". As Val joked at the Women's Bookshop, "Typical bloody Oxford, they even did that first!" Val was asked what books she'd read recently that she enjoyed and what other crime fiction authors she liked. She put in a very nice unsolicited plug both for CUT & RUN by Alix Bosco, which she'd read while on her New Zealand tour, and the Ngaio Marsh Award for Best Crime Novel (she was working her way through the finalists for the award, and was looking forward to trying the others, as we had some good crime writers here in New Zealand). In answer to a question about ideas, and getting issues into her books, Val shared a story of how she'd found out about the experiments the Germans did on their own Germanic children during the Second World War, while she was researching river boats in Germany - and had become so fascinated about this piece of history she'd had no idea about, that she'd woven it into THE LAST TEMPTATION. Val commented that all of her books, in one way or another, address the theme that we can't ever completely escape our past, that it always comes back. She talked about winning the Cartier Diamond Dagger, and how the actual Diamond Dagger is kept in a secure safe, and recipients receive a small dagger brooch with a tiny diamond, ruby, and sapphire on it, rather than the Diamond Dagger itself to keep. On a semi-related point, Val also kindly allowed Carole Beu, the owner of the Women's Bookshop, to use some of Val's time to share some information about a cause dear to her heart - the ongoing struggle of Carole's longtime friend Bronwyn Gray, whose daughter Lisa, a successful lawyer, suffers from an extremely rare condition called Lymphangioleiomyomatosis (LAM); a form of incurable lung cancer that affects only women. Over the years, Bronwyn has raised hundreds of thousands of dollars for research and organised several international conferences to look into this disease, and now she has been nominated a Kiwi Battler, where the public gets to vote on 'Kiwi battlers' from each region, who can win $10,000 to help their charity of choice. Kiwi Battlers is the brainchild of businessman and philanthropist Gareth Morgan, whose foundation is donating the money. With Val's blessing, Carole asked the audience, and anyone we passed the information onto, to consider voting for Brownyn Gray for the award, as the money could make a real difference to the LAM Trust, which is doing groundbreaking work but is not so well known amongst the wider populace. If you wish, you can vote for Bronwyn here. I just listened to a podcast of Val McDermid's recent appearance at the Melbourne Writer's Festival and I can see how she would have captivated an audience for such a long time. She really did seem to give of herself in a very non-self promoting way. I've found her Tony Hill books a bit too violent for my liking but she explained the reason well in her interview and I will definitely be checking out this latest of her books. Her other series aren't as brutal/violent/gory as the Hill and Jordan books Bernadette, although they still do involve some dark crime of course. I heard her speak at the Budleigh Salterton Literary Festival in front of a very prim and proper, upper middle class audience [well apart from me] and she had us completely entranced with her stories of Glasgow and Oxford. I had steered clear of the Hill/Jordan books after watching a TV adaptation thinking the author must be an ogre, but she is charming. Oh, I'm so jealous. She's my favorite crime author! I would love to meet her someday. She's the inspiration behind all my books.